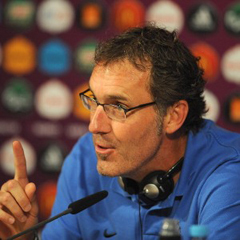 Paris - Laurent Blanc will not renew his contract as coach of France he and the French Football Federation (FFF) confirmed on Saturday. The 46-year-old said in a statement that he and the FFF president Noel Le Graet had not been able to reach an agreement on a new two year contract which would have come into force on Saturday when his former one ran out. "During our discussions on June 28 (with Le Graet), we were unable to find common ground on the management of the French team for the next two seasons," said Blanc, who ironically had rejected Le Graet's suggestion to give him a four year contract in 2010 saying it was premature. "Under these conditions and after reflecting on the matter, I could not but confirm to him, on this day Saturday June 30, my decision not to ask for my contract to be renewed by the FFF." Blanc, who took over from the much-maligned Raymond Domenech after the 2010 World Cup debacle, had achieved the minimum target set for Euro 2012 in reaching the quarter-finals where they bowed out 2-0 to defending champions Spain. However, much of the credit he had accrued during his two-year tenure including a 23 match unbeaten run - which included a draw and a win in their first two group games in Ukraine - and his restoring of the shattered image of the French squad thanks to the events in 2010 disappeared by the end of the tournament. The unbeaten run ended with a 2-0 defeat by already eliminated Sweden in their final group game and this sparked dressing-room discord with several players arguing among themselves while Blanc and Hatem Ben Arfa had a lively row. This reawakened for some players like veteran Florent Malouda the demons of 2010 though the ramifications were nothing like as catastrophic. By finishing second to England in the group it meant they had to face Spain - the other option as it turns out would not have been any easier as runners-up in Spain's group Italy have reached the final as well - and duly bowed out tamely with Blanc being criticised for selecting an overly defensive line-up. The post-match outburst by volatile forward Samir Nasri ended the campaign on the worst possible note for the coach given the headlines that ensued. Rene Girard, coach of French champions Montpellier and assistant to Roger Lemerre when France won the Euro 2000 title, said it was a pity Blanc had left but added he wasn't too surprised. "He was not able to get the answers he wanted vis-a-vis the World Cup," said Girard. "Other possibilities are that a club offered him something and he took stock of the present squad who perhaps will struggle to achieve anything, and that it would be tough to transform them into winners." Blanc had held talks with Le Graet, who was not one of his biggest supporters in the first place, on Thursday and emerged saying they had gone well but that both parties needed 48 hours to reflect on their positions. Bones of contention for Le Graet were largely based on what he saw as extravagant expenditure such as the 22-person backroom staff. Ominously one source close to the talks told AFP at the time: "Blanc wanted to hear 'I am eager to work with you' but this phrase was not uttered." As for successors the name of former Lyon, Rangers and Cameroon coach Paul Le Guen has been mentioned as has that of Blanc's World Cup and Euro winning skipper Didier Deschamps, who is presently negotiating his departure from Marseille. However, Deschamps would not come cheaply and like Blanc is represented by a bete noir of Le Graet's Jean-Pierre Bernes, who also represents several of the players much to the annoyance of the Federation president. France's first 2014 World Cup qualifier is on September 7 against Finland in a group that also contains Spain while they have a friendly against Copa America champions Uruguay on August 15 at Le Havre.